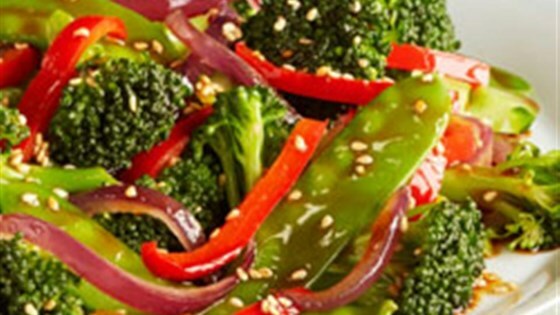 "Broccoli, snow peas, red onion, and bell pepper are stir-fried in sesame oil and seasoned with soy sauce and sesame seeds." Trim broccoli leaving 1 inch of stem. Cut the remaining stems into small slices. Place broccoli and snow peas in a saucepan of boiling water and cook for 1 minute, drain and rinse immediately with cold water then drain well and set aside. Heat a large wok or large skillet over high heat. Add sesame oil, blanched broccoli and snow peas, red onion, red bell pepper, and garlic. Stir-fry for 1 minute. Add the snow peas, soy sauce and stir-fry 1 minute longer. Remove from heat and stir in sesame seeds. This tasty party pizza is like creamy veggie dip in pizza form! This will be a weekly dish made in my kitchen! Was too salty for us, I would cut back on the soy sauce. I will fix it again, just adjust for the salt (and I like salt). It was only okay, I liked the sauce from a different recipe better and will use that next time.